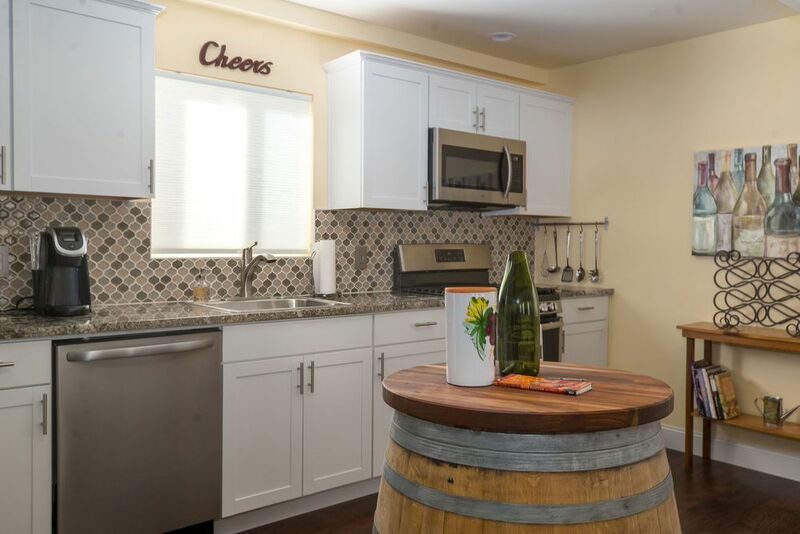 The Wine Barrel Cottage has traditional decor with a wine theme. Enjoy the wine barrel vanity in the master bathroom or the wine barrel island in the kitchen. This cottage has a full kitchen with all cookware and dining necessities provided. Appliances include refrigerator, gas range, dishwasher, microwave, Keurig coffee maker as well as French Press, electric kettle, toaster, blender and hand mixer. Indoor laundry facilities. Bedrooms feature one King and one Cal King size beds. THE WESTSIDE COTTAGES are a group of 7 small cottages designed with the personality of Paso Robles! Each cottage is different. It is a great place to rent for small or large groups who would like to stay together but want their individual space. THE WEST SIDE COTTAGES are a group of 7 small cottages designed with the personality of Paso Robles! Each cottage is different. This cottage has another unit below. See our listings to find the other 6 cottages. This home features 2 bedrooms with a Cal king and king size beds and two full bathrooms. Enjoy preparing dinner in the fully-stocked kitchen complete with a refrigerator, dishwasher, microwave, Keurig coffee maker, and blender. This cottage has everything you need for a perfect getaway! This cottage is part of a cluster of 7 vacation rentals in downtown Paso Robles. You can rent one or several cottages for larger groups. This cottage is located above another unit. Perfect for 4 people. Would like a couple more places to sit in the living room. This property was very nice. Clean and well maintained. Great location too. The kitchen is a little sparse on cooking utensils and pots/pans. I probably would have given 5 stars except that it is not handicap accessible. I was unexpectedly on crutches during our stay and had to traverse quite a few large steps to access to cottage. This property is not ADA compliant as there is no ramp for access. Comfortable beds, very clean and warm home, great location, great decor. We will definitely be coming back! Had a very relaxing stay here. Very quiet, clean and a great value. Great place. we would book again. Great house. Might want to put enough seating in living room for 4. Patio area a little stark. The Wine Barrel Cottabe was one of several on the property. All newly remodled and nicely supplied. The cottage is close to town but not exactly walking distance. We all liked the area and surrounding trees. We did have a problem with communication after leaving as we realized we left our business phone in the cottage. We could not get anyone to answer their phone from the property. We ended up driving back 2 hrs to pick up the phone.